Today we are groundbreaking and measuring (this also involves another “ceremony” which I will miss as I need to be in town to get building supplies. It is amazing how the measuring is done. the building layout on the ground started as some sort of parallelogram which got me a but worried, but they soon have it marked up after I have set the first stake in the ground. 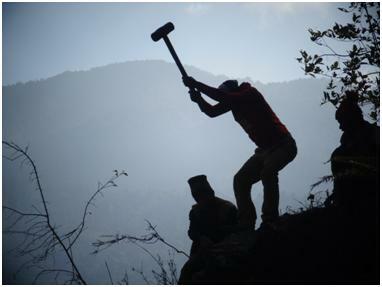 Some of the young guys are hard at work quarrying stone off the mountain side. Back breaking work. There is no actual quarry, they just go and find some rock sticking out of the mountain side as near to the road as they can get and start hammering a way at it. 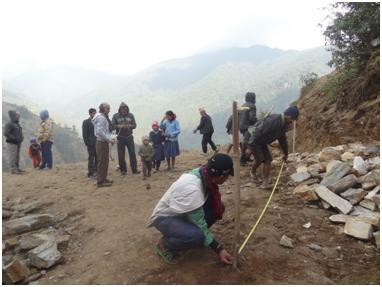 Occasionally they might go far down the valley to the wide river bed to load up stones form the river, but this is long journey and does not provide the right sized stone which can be chipped at for building. 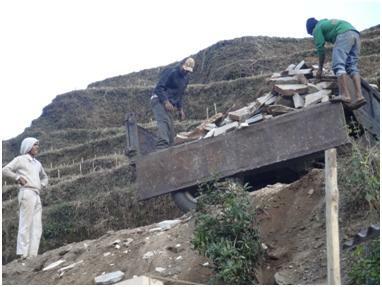 There has also been a lot of price negotiation for use of a tractor that Sudip is using to deliver stone to his own building site. 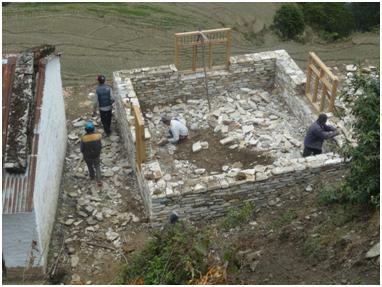 I know some are looking to me in hope – but we agreed at the beginning on the contribution the village would make to the project which is the raw stone and get it to site, whilst I pay for the daily labour and various other materials, such as cement, roofing, nails, steel rods and various other bits and pieces needed. I am keen this is not a one way resource/financial commitment. 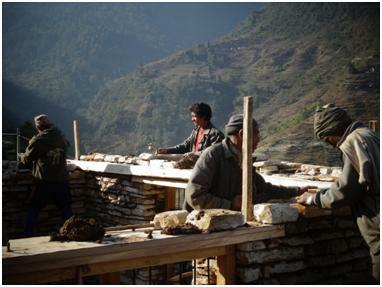 Providing paid work at the daily rates they determined is a significant amount of income for each family where there is no paid work in the village. 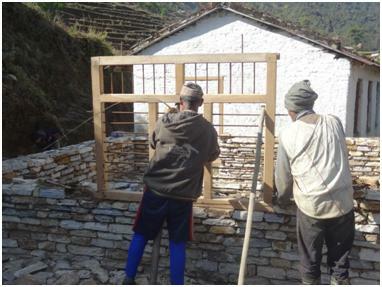 In addition to the stone the village also agreed they would provide the wood for the roof rafters and window frames. 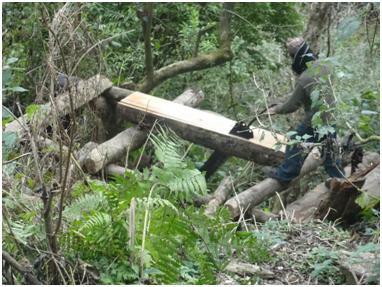 This is precious resource – each year they are allowed by the government to cut down a set number of trees in an attempt to maintain good forest cover but also enable the village to meet their needs for building, repairs and fire wood burning. 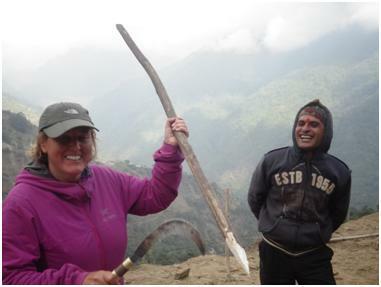 The cut timber also needs to lie cut for a a period of time to dry out to ready for building, the timber being used has been stored by Shiva’s family for future building and the villagers will compensate the family by providing them with timber next year. 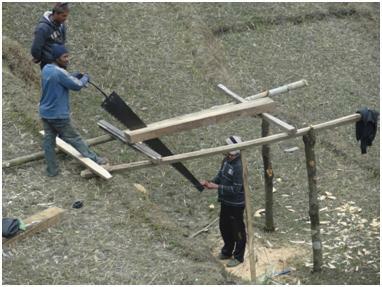 The carpenters Babu and Devi Lal have some ingenious constructions for their manual saw mill, using the steep mountain side and rice paddies to good effect. and 22 days in and we have made it to roof level… happy days. We may actually get this finished in time, but I think I will have to extend my return flight date. Cutting it pretty fine.